The Challenges to Library Learning: Solutions for Librarians is an insightful volume that offers a practical philosophy of engagement that can be used to meet the growing challenges facing librarians, including staffing shortages, depleted or eliminated training budgets, longer hours, greater workloads, and rapidly-changing technology, hindering the ability—and willingness—of employees to continue job education in library sciences. 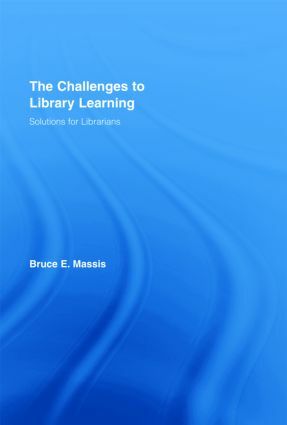 With three decades of experience as a library administrator, author Bruce E. Massis details an effective plan for inspiring initiative in the learner to pursue a goal-oriented and individualized approach to learning – helping the library to become more efficient, productive, and user-centered. Topics discussed include overcoming staff disengagement, accepting e-learning as a routine learning model, teaching and measuring information literacy training, creating a flexible alternative staffing model, the Community of Learning Program (CLP) for library staff, and the details of creating and implementing a training program. The Challenges to Library Learning: Solutions for Librarians is a vital and practical resource for anyone actively involved or pursuing a career in library administration. Bruce E. Massis, MLS, MA, is Director of the Educational Resources Center at Columbus State Community College in Columbus, Ohio. He has served as a library administrator in multitype library consortia (SEFLIN, SCLS), public (Brooklyn and Hoboken Public Libraries), special (JGB Cassette Library International), and academic libraries (Adelphi University and CSCC) for more than three decades. Mr. Massis has worked in an official capacity within the International Federation of Library Associations (IFLA) and spent more than 20 years cooperatively developing programs, projects, and policies with international library colleagues. Active in numerous library associations and widely published, his books include Interlibrary Loan of Alternative Format Materials; The Practical Library Manager; The Practical Library Trainer; Serving Print Disabled Library Patrons; Library Service for the Blind and Physically Handicapped: An International Approach; and Models of Cooperation in the US, Latin America, and Caribbean Libraries.